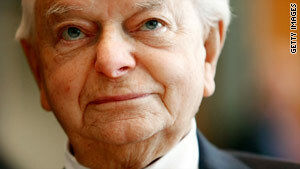 Sen. Robert Byrd became the longest-serving member of Congress last year. Washington (CNN) -- Sen. Robert Byrd, the 92-year-old Democrat from West Virginia who is the longest-serving Congress member in history, has been hospitalized in serious condition, his office said Sunday. Byrd was admitted to a Washington area hospital last week and his condition is "seriously ill," according to the statement by his office. Initially thought to be suffering from heat exhaustion and severe dehydration, Byrd was expected to remain in hospital for "not more than a few days," the statement said. "However, upon further examination by his doctors, other conditions have developed which has resulted in his condition being described as 'serious,' " the statement concluded. West Virginia Gov. Joe Manchin said in a statement Sunday that he and his wife "are thinking about and praying for Sen. Byrd and his family." "We are truly hopeful that he gets well soon because West Virginians need his leadership in Washington," the statement said. "Sen. Byrd is a true champion for our state." Slowed by illness in recent years, Byrd spent six weeks in the hospital in 2009 due to a staph infection. Last November, he became the longest-serving member of Congress at more than 57 years, surpassing the old record set by Arizona Democrat Carl T. Hayden. Byrd also is the only person elected to nine full terms in the Senate. He served six years in the U.S. House before becoming a senator, and has never lost an election.